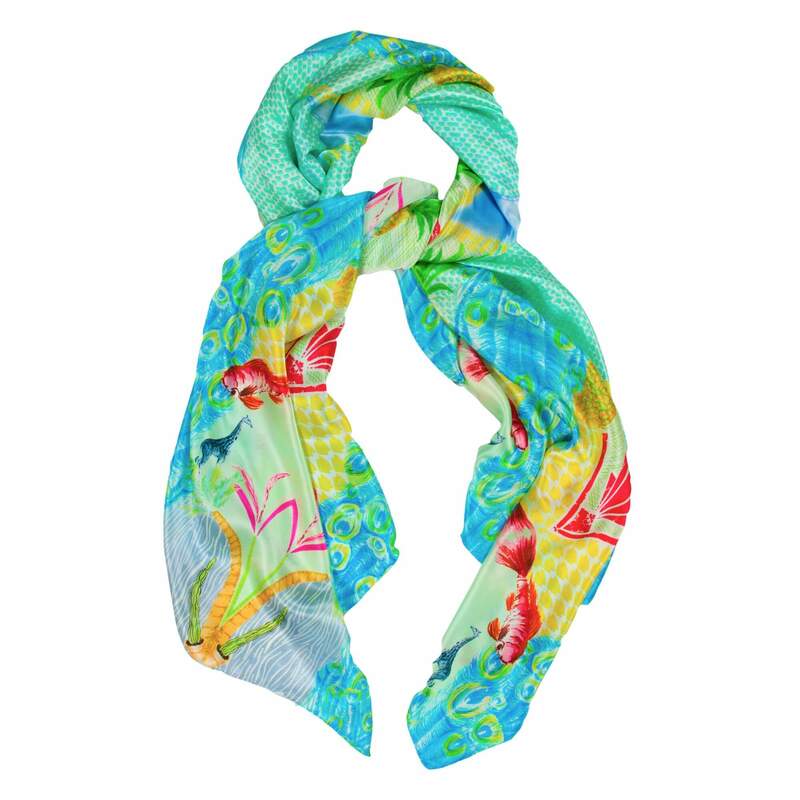 View cart “Mint Parrot Silk Satin Chiffon Square Scarf” has been added to your cart. Silk satin chiffon scarf with a classic Jenny Collicott design. 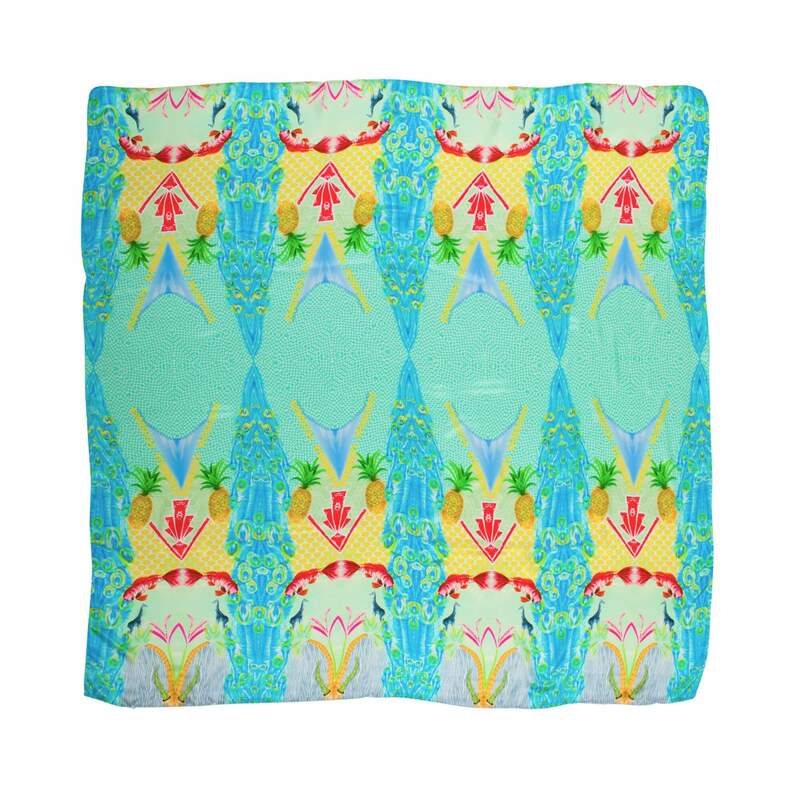 A fun, playful scarf showing Jenny’s fascination with culture, colour and the natural world. Using a variety of drawing, painting and many other techniques, bursting with these artworks and full of hidden details. Silk satin chiffon is a soft fabic with the beautiful drape of chiffon and the sheen of satin displaying the intricate print. A fun, playful scarf showing Jenny’s fascination with culture, colour and the natural world. This Pineapple Scarf photographic and digital techniques creating a surreal design. It is bursting with artworks and full of hidden details. Silk satin chiffon is a soft fabric with the beautiful drape of chiffon. The sheen of satin displays the intricate print on the Pineapple scarf. Fine silk scarves, with must-have prints by Jenny Collicott. Hand-drawn wearable art in square styles to set off colourful outfits. Long scarves to drape. Large designs to unfurl and show off. A year-round statement layer: ideal for warmth and for brightening up a simple look. Time to invest in a new autumn/winter spring/summer Pineapple Scarf now. Elegant silks in painterly prints. Loop over sweaters, dresses and T-shirts for an instant outfit switch. It’s a wrap! Our unique designs are versatile and stylish scarves. Quirky prints in silk make a statement. Find elegant silk scarves in a range of chic designs and patterns. Complement any look with our latest collection as well as our past collections. Pineapple Scarf is from the SS15 collection. Add some a chic touch to your outfit with Pineapple scarf, or check out designs from our other collections for print, pattern and colour overload. Pineapple Scarf. Jenny Collicott is a printed textile designer, based in London. She finds inspiration in an eclectic range of sources. From the unobserved objects of the everyday, to the wild animals of the Serengeti, as well as her travels in the Far East. Giving her brand a contemporary feel, a commercial edge, and point-of-difference in the competitive scarf marketplace. This exceptionally talented emerging designer’s work couples traditional Britishness with an exotic and irresistible quirk.